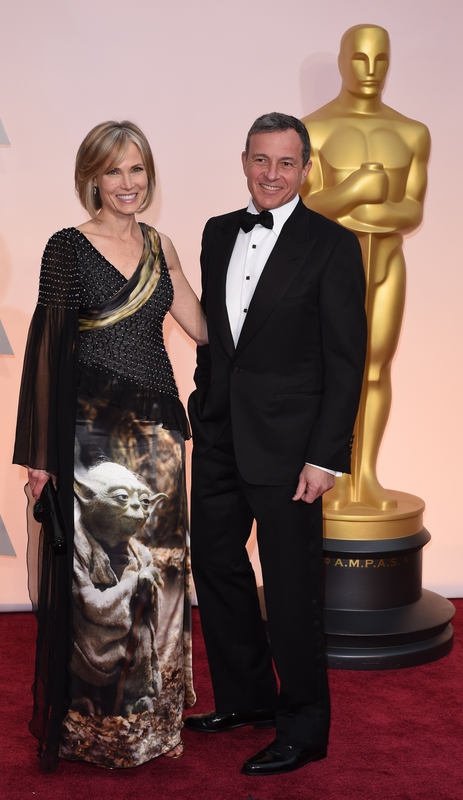 Rodarte's Yoda Gown Makes Oscar Appearance On Willow Bay, Wife of Disney CEO Bob Iger. Yes, Yoda. The days following a big award show are usually filled with best dressed, worst dressed, strangest dressed lists... you name it, there's probably a list for it. But sometimes an ensemble or two falls through the cracks. Of course Lady Gaga's 2015 Oscar gown (complete with gloves) is going to make every single red carpet roundup, but sometimes there are bizarre gowns worn by less famous stars that we just don't get to appreciate properly. Luckily, though, the Internet exists for this very purpose — to find the most amazing, weirdest things in this world and put them in their proper spotlight. This is where we get to Willow Bay, wife of Disney CEO Bob Iger, and the Yoda-themed Rodarte gown that she wore to the 2015 Academy Awards. Let's go over that again really quick: Her Yoda-themed gown. OK. Just making sure you all got that part. I'm not completely sure what statement Bay was trying to make on the red carpet with the Yoda dress other than, maybe, I don't know... that she is a big fan of tiny, mythical creatures and/or Star Wars in general (I guess the latter makes more sense)? But, in any case, a statement was made. A big, big statement. The first half of the dress is pretty standard, so it really throws you for a loop when you scan down to the rest of the dress and you just see Yoda hanging out casually. How did we miss this on awards night, guys? Forget Lady Gaga's red rubber gloves, how did we miss a literal YODA DRESS during the most fashionable night of the year? These are the questions that keep me up at night. If you know your fashion history, you'll recognize this from Rodarte's Star Wars inspired Fall 2014 collection. It's like Game of Thrones on the top meets teenage boys bedroom from the '80s on the bottom. It's terrible and wonderful and delightfully strange, and come on — you can't help but smile about the whole thing. Sure, the look is a bit confusing, but it's fun and weird and unique at the same time. I mean, are we ever going to see anything like this at the Academy Awards again? The answer is probably (hopefully?) not. So props to Willow Bay for doing her thing and not caring that it makes her stand out in a big, big way. You do you, girl!